Hey, Final Fantasy fans, got $200 lying around begging to be spent on video games? 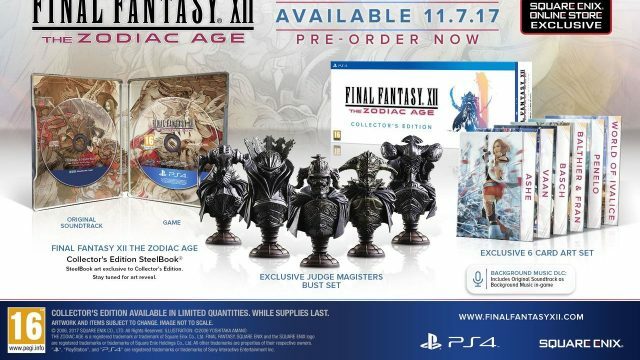 Because that’s how much you’re going to need in order to purchase Final Fantasy XII: The Zodiac Age‘s Collector’s Edition. The luxurious package includes a set of six art cards – featuring the likes of Vaan, Ashe, Basch and other notable characters from the RPG – a SteelBook game case featuring exclusive artwork and a code to unlock Zodiac Age‘s Background Music DLC, allowing players to listen to the original soundtrack as background music in-game. Of course, that doesn’t sound like enough to justify the $200 price tag, but that’s largely due to the main focus of the Collector’s Edition – an exclusive set of five Judge Magisters busts. If that sounds exactly like something you can’t live without, the Collector’s Edition is currently available to pre-order on the Square Enix official store, limited to one copy per customer. For those unable or not willing to take the plunge on that, a $50 Limited Edition is also available, which includes a SteelBook case and the aforementioned music DLC. A high-definition remaster of the original game, Final Fantasy XII: The Zodiac Age is due to release worldwide on July 11. Just a handful of gameplay videos has been released since the remaster was announced last year, although judging by the latest footage to have come out of PAX East over the weekend, this re-release looks to be receiving the same care and attention from Square Enix as its upgrade of Final Fantasy X did. That is, much more than just a simple port. Check out the gameplay below for a taste of what to expect this summer.